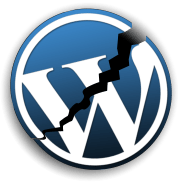 No worries, this WordPress guide will cover some of the most common reasons why your blog is broken and how to fix it and not do it again. The point is to learn from mistakes and if this issue happens again, you already know how to fix it or can even help your friends out fixing their blog. The most common problem is the sidebar is pushed down below the posts on the main index page. Usually, this is a result of bad HTML code, an open HTML tag or formatting from a website or MS Word within a post. Just how does this bad code get into a post you ask? Well, usually it comes from copying something from an existing website and pasting it into the Visual editor when creating a new WordPress blog post. It can also happen if you write your post in a program like MS Word and paste it into the visual editor when creating a post. Pasting from a website or MS Word will retain the formatting of the page and bring in all the other HTML elements and even scripts that you can’t see. To check for unwanted HTML and scripts in a WordPress blog post, click the HTML or Code editor on the top of the edit post box and look for any unwanted HTML or formatting. To eliminate this possibility altogether, paste any copied text into the HTML or Code editor instead of the Visual editor. Then you can click back to the Visual editor to format the post to your liking. This will not bring in any HTML, scripts or format into your new blog post. Example of a banner image code copied wrong. I need to fix that before saving it as that will codes strange things in the sidebar and now completely show that image in the text block. Remember when making any new posts view your blog to make sure there are no errors or problems. Also if you are going to customize WordPress by editing the theme’s template files create a backup of the file first and check the site with each change. If you have any questions, submit them to our Ask Jaz page. I will be more than willing to help you.